Beautifully engraved RARE Specimen certificate from the Globe Ticket Company printed in 1951. This historic document was printed by the Security Banknote Company and has an ornate border around it with a vignette of a Globe. This is over 56 years old. This is the first time we have had this for sale and we only have one. 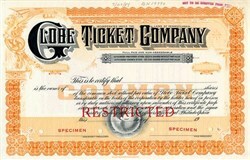 The Globe Ticket Company was one of the world's largest ticket printers. They printed tickets for all the major sporting and entertainment events.